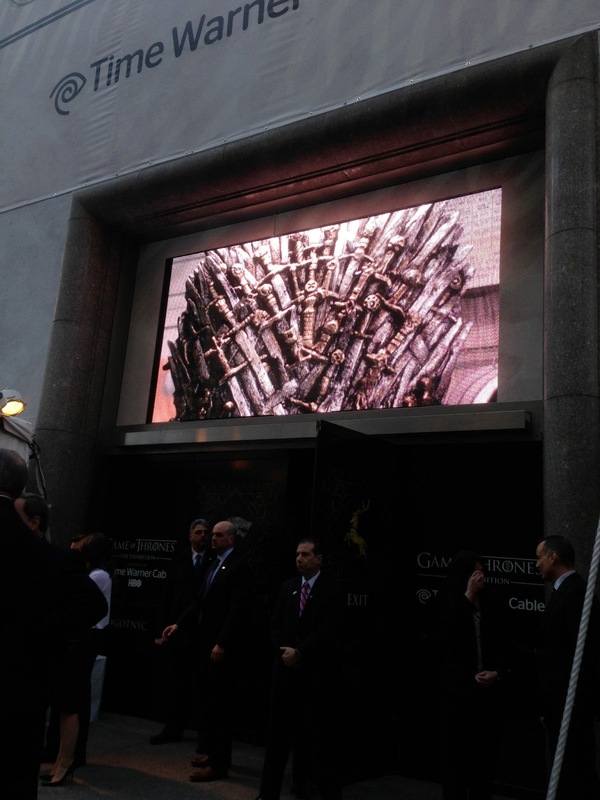 WillingToBeLucky.net: Game of Thrones: The Exhibition Opens in NYC! 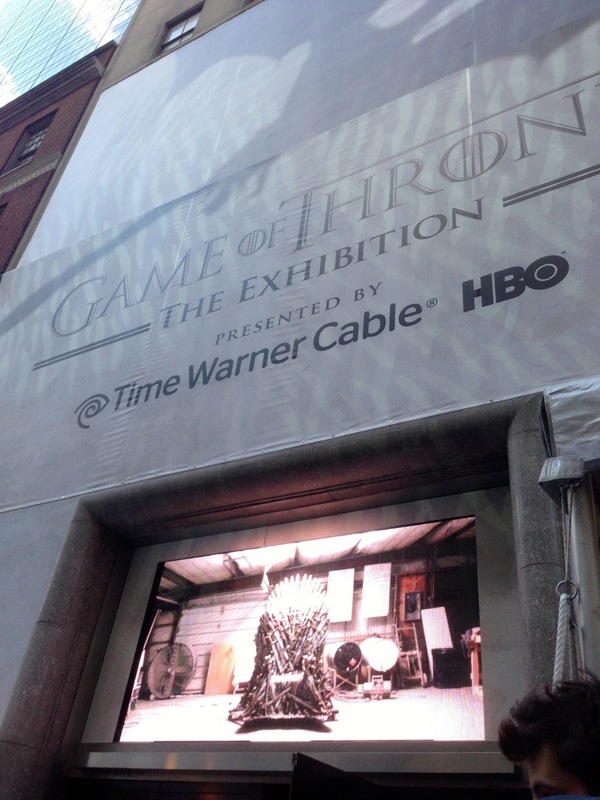 Game of Thrones: The Exhibition opens to the public today but on Wednesday night, the exhibition held a VIP opening night event! Again, I was not quite cool enough to actually attend the event but I was hung around to see what I could see! 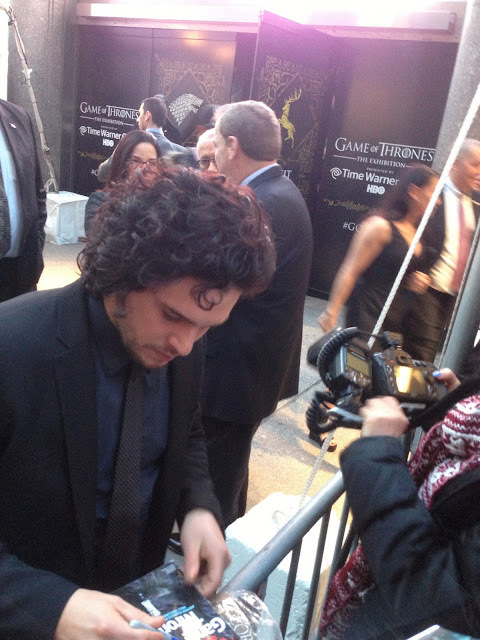 Armed with my trusty iPhone 5 and my lovely map of Westeros, I was ready! 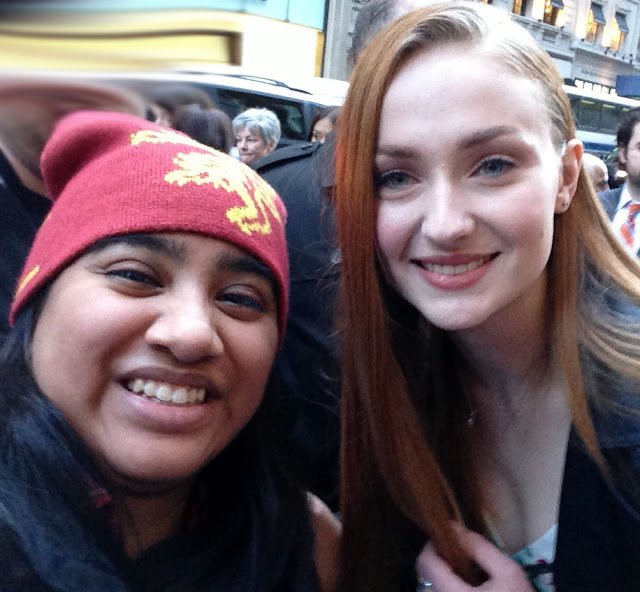 The guest list included Game of Thrones' stars Kit Harington, Rose Leslie, Natalie Dormer, Sophie Turner, Maisie Williams, and John Bradley! The cast was rushed in about an hour before the press line was set to start. 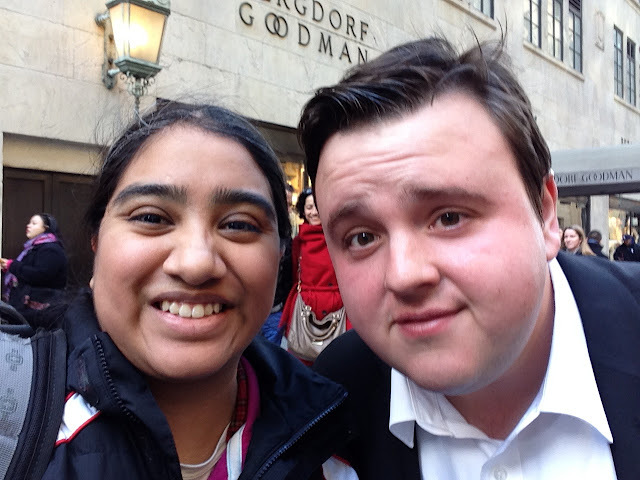 I managed to grab a quick photo with John Bradley who plays the likeable Samwell Tarly, a member of the Night's Watch. 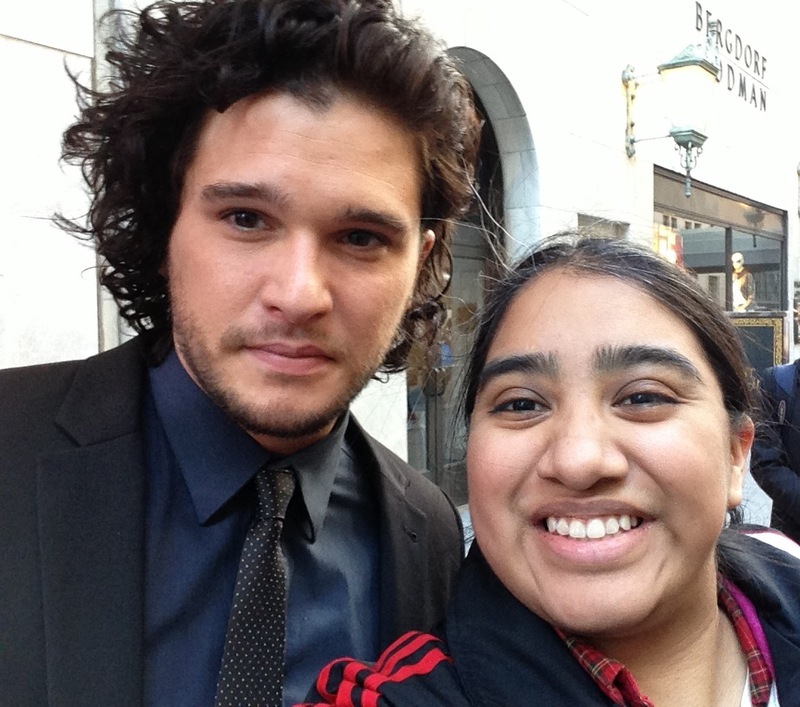 Shortly after, Kit Harington who plays Jon Snow, came out for a quick smoke and was kind enough to sign and take photos! They ushered the cast to the press area not too long after; they all promised they would stop on the way out. 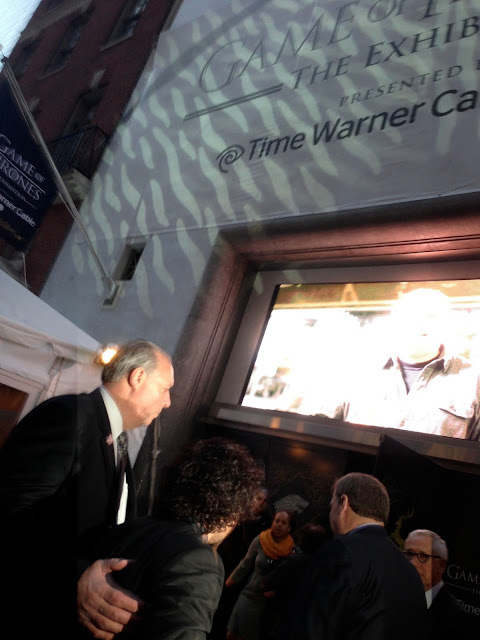 After spending about a half hour with press, they did start making their way out and heading back in to the exhibition. And thankfully they all pretty much stopped!!! 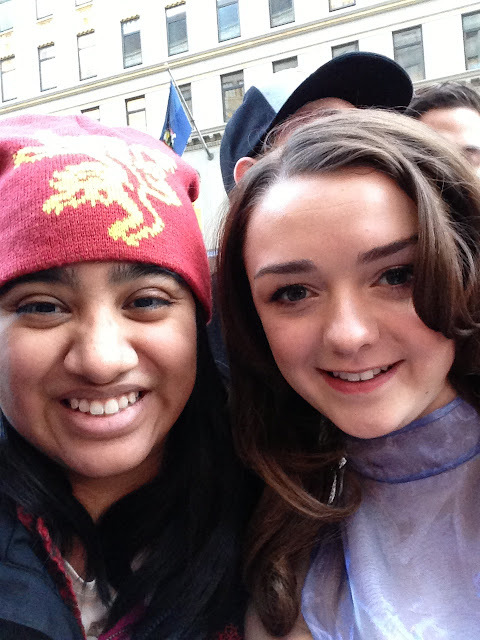 They were all lovely and chatted with the fans, stopping for pics and signing. Maisie Williams kindly took a photo for me, snapping twice after the first didn't come out! Sophie Turner was just as kind, stopping to sign my poster and snap a pic! Kit stopped AGAIN! That evening he ended up stopping three times for us! HE tried a fourth time when he was leaving but we'd all gotten him! My photo with Natalie Dormer didn't come out quite as well but she was still so nice! 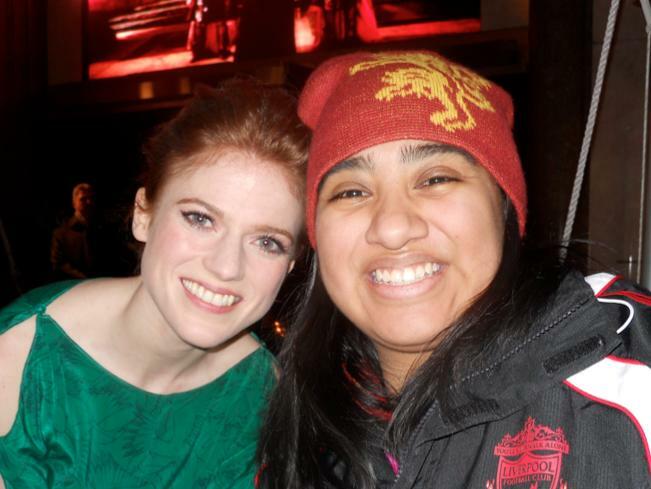 I also was able to grab a photo with Rose Leslie who was also happy to sign my Downton Abbey poster! We also went over to Whole Food's to try the new Ommegang's Iron Throne Blonde Ale! It was delicious and I HIGHLY recommend grabbing some for your premiere viewing party this Sunday!!! Head to the official Ommergang site for more info and where to find the beer near you! I can't wait to hit the exhibition tomorrow! It will be exciting and I'll be sure to post about it ASAP! Content: Costumes, props, armor and weapons from the series, Blackwater Bay Interactive Experience (places fans amid the action of the epic battle) and photos taken on the Iron Throne.